Alaska is very very cold. My grandma has ben there lots of times. There are husky dogs there in Alaska. You have to race on sleds. 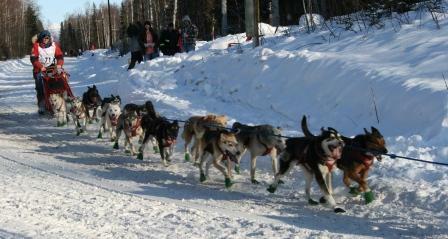 The dogs pul the sleds so you can go. There are 62 people on the sleds. There are 992 dogs puling you. This first grader took herself to the computer at home and wrote this story. She asked questions about the number of dogs and people and how to spell people. That’s it. I discovered the story in the printer tray. Engaged in the topic of the Iditarod and Alaska, this young writer produced the basis of a seven page picture book. "You have to race on sleds." Where could you take this story? Illustrate each sentence, publish the work, and now you have a published author. A thermometer showing cold temperatures on page one, sleds on page 4, and it would be fun to see how young authors illustrate 992 dogs pulling. Hold an authors’ reception complete with ice cream sandwiches, sno-cones, or milkshakes. What national standards (NCTE) would this meet?